I was raised on a ranch in a small community where everyone knew everyone. I also was inducted into the reality of accidental death at a very early age. When I was ten years old, Gordon Collier, my friend, my crush, the most beautiful boy in the world, died while riding a dirt bike at a nearby gravel pit. What stands out in my mind is the affect on the family and on (we) the children. What I learned from that experience is there is no acceptable number, no acceptable loss. The impact of Gordon’s death on his friends, classmates, family and community was beyond measure. When we determine change and policy based on statistics, we are completely ignorant of the true impact of the issue. It simply can not be measured in numbers or dollars and cents. I fast forward to July 27th, 2013. I did not know that the speed limit was 50km an hour on all residential streets unless otherwise marked, nor did I give it much thought. I did not know that the law would permit speeds of 10 to 12k over the speed limit before issuing a ticket. I did not know what would happen to a person when hit at 50km an hour. I did not know Neil, or at least I did not know his name, but I knew his face and I knew him as one of the many children who would play near the streets in my community. I was afraid for his safety as he and others would skateboard, bike and play where commuters were “commuting” with little regard for the activity around them. Two weeks before the accident, I found him on the sidewalk rubbing a bruised ankle. I stopped to ask if he was okay, and watched as he nodded and quickly dashed away on his skateboard. That is the last time I saw him alive. I was quickly assured that in fact, what we were looking at was actually what would be expected at 50k- 60k. I did not yet know that this was the same boy who I had helped only two weeks before. On that day, I came to know the impact of what is seemingly slow speed, has on a human body. I also was made aware that all streets are 50k unless marked otherwise, a speed limit that would most certainly end in injury or death. I was appalled and angry at a system that had failed, knowing that the legal speed is entirely too fast. I got in my SUV and I went to the very street where the accident happened, and I tried…I really tried. I “punched it”, heart pounding, trying to hit 50km through a blind intersection with a two-way stop that most ignored, up a steep hill, on a road less than four metres across, and I couldn’t do it. I failed… yet an inexperienced driver managed to accomplish what I could not, and a boy who had promise in the world, is no longer with us. And it is completely acceptable. I proceeded to drive other streets in the community and monitored my speed. Never did I comfortably exceed 30k. I can’t blame the teenage boys who were in the SUV that struck and killed Neil as the law permitted the speed, however fast and dangerous. The 12 year old made a mistake, which children often do. The problem is in the policy, which is outdated, and unsafe. I went home and I began to research on my computer “speed and pedestrian death”. The information was overwhelming. I found studies and statistics supporting my observation and recommendations from the most credible resources, including the Chief Coroner of Ontario, stating that the currents speeds on residential streets were deadly. Therefore I refer to a 12 year old boy named Neil, when I speak to lowering speed in communities because Neil defined an issue, which is the safe and acceptable speed on residential streets, and it’s not 50km/hr. It is an undebatable truth in physical law that the chance of death or serious injury does not increase in relation to speed. In fact, the chance of death increases exponentially with even a minor increase (10km/hr) in speed. • 64 km per hour impact speeds: 85 percent death and 15 percent injured – no one uninjured. Of course it goes beyond speed; it is understanding, education, compassion, empathy, respect and an appreciation for a livable community, regardless of where you live. However, until we as a society reach a level of humanity that puts others before our selves, we have no choice but to create law to govern behaviour. That is the nature of law. For this reason, I request that we reduce the speed in residential communities to save lives and improve livability and safety. There is no statistical number than can measure the loss of a life, or the impact it has on a community. I wish I could go back in time, but I can’t, and now I know… 50k is not okay on residential streets where children play and people live. Community Safety Minister Yasir Naqvi says the Ontario government is ready to move on reducing speed limits on residential streets to 40 kilometres an hour. The Ontario government is putting the brakes on speed limits along residential streets across the province. 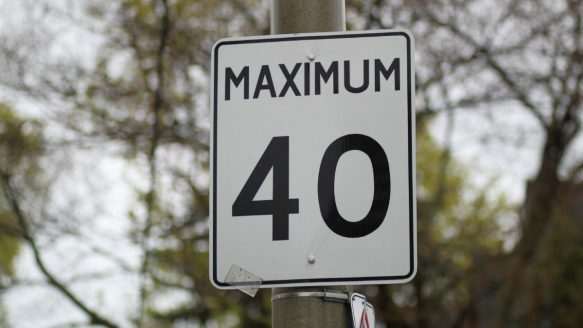 Community Safety Minister Yasir Naqvi told Ottawa CBC radio on Friday the Liberal government is expected to table an amendment to the Highway Traffic Act this fall lowering the default speed limit to 40 kilometres per hour from 50. “Fifty kilometres an hour is too fast,” the Ottawa-Centre MPP told CBC, adding he supports the move to lower the speed limit. “If you look at some other jurisdictions, like New York City and Paris, you’ll see they’re taking the same initiatives,” Naqvi said. “And I think it will put Ontario in a leadership place in North America by reducing the speed by these 10 kilometres an hour,” he said. Neither Naqvi nor his office could be reached by the Star for further comment. “New Democrats are open to ways to improve road safety. As always, we will look closely at any legislation brought forward and consult with police, municipalities, and other stakeholders,” NDP transportation critic Joe Cimino said. In Toronto, there has been pressure on city council to lower the default speed even lower to 30 km/h on residential streets in some cases. Toronto’s chief medical officer Dr. David McKeown in 2012 advocated a 30 km/h speed limit on residential streets and “a citywide speed limit of 40 km/h on all other streets” to reduce the severity of injuries to pedestrians and cyclists. McKeown made the proposals upon the release of a $45,000 report, “Road to Health: Improving Walking and Cycling in Toronto,” which cited evidence that pedestrians are far less likely to be killed for every 10 km/h reduction below 60 km/h. “Small increases in traffic speeds results in a disproportionately large increase in pedestrian fatalities,” McKeown wrote. According to the World Health Organization, almost 50 per cent of pedestrian deaths occur when the car is travelling at 50 km/h. At 80 km/h, the odds of survival are close to nil. But at 30 km/h or slower, more than 90 per cent of those struck make it out alive. The Star previously reported that reducing deaths is one reason cities such as Paris have put in place, or are pushing for, nearly citywide 30-km/h speed limits. And not only that, say advocates: a 30-km/h limit reduces congestion and energy costs, is environmentally friendly and strengthens a sense of community. Tory critic MPP Michael Harris said he first wants to see the studies that clearly prove that lowing the speed limit by 10 km/h will saves lives. “It is important that any changes to the speed limits are based on research and data,” Harris told the Star. Pat Vinini, executive director for the Association of Municipalities of Ontario (AMO) said talk of reducing speed limits is news to here. “I don’t understand what is behind this proposal. Certainly it is not coming from our members,” she said.